Ok, let's see a show of hands! How many of you have a Potemkin village business plan? Come on! 'Fess up! You know it's true. It's OK. It's safe to admit it here in the comfortable anonymity of reading someone else's blog. An impressive facade or display that hides an undesirable fact or state; a false front. Sound like a familiar business practice? Many entrepreneurs and business owners only write a business plan when forced to by banks, lenders, investors or others sources of financing. The plans are inflated, glossy, filled with hyperbole, have only a passing resemblance to the business' real condition, and are discarded and forgotten as soon as the immediate need is past. So drop that Potemkin facade. Your business plan can be a vital, instructive, guiding process for your business, helping you visualize where you are now, where you want to go and what adjustments you can or should make to achieve your goals. Go on. You can do it. Put some real substance into your plan. Build on a stable foundation, hammer together a sound structure, and fill it with reality-based content. Review that plan every month, analyze the results and when you remodel, know why you are doing it. Nobody really wants their business to be blown down the first time adversity huffs and puffs. ... my startup gets $2 million investment and spends $712,417 in expenses and $154,000 in other assets, leaving $1,133,583 in cash. Of the $712,417, $425,000 was for depreciable L.T. assets (i.e furniture).If I enter $425,000 in startup table under L.T. assets, and keep the $2 million total committed, I would have to reduce the cash available balance which is double dipping. Well no, not if you subtracted that $425,000 from the $712,417 that you have as expenses. And the balance sheet is affected because it shows $0 L.T. assets yet depreciates $33,600 annually. How can I account for the $425K in L.T. assets in balance sheet without affecting cash balances and paid in capital value of $2 million? Here too, after subtracting the $425,000 from the expenses and putting it into the starting long-term assets, it will then show up as starting balance of long-term assets, which will make your depreciation make sense as well. What's going on there is the questioner is double-counting $425,000 in long-term assets by including it as part of the expenses. It should have been $287,417 in expenses and $425,000 in long-term assets. And I'm posting it here because it's just another reminder that in the world of financial projections we're kind of stuck with definitions as standard accounting (that would be generally accepted accounting principles, called GAAP) defines things. It doesn't help to just assume common meaning. And of course the tax authorities stick with very exact definitions too, and for taxes, there is a huge difference between money spend on expenses and money spent on assets. Too bad, this should be simpler. But it isn't. I'm at the point where I have to decide if I should hire employees or farm out certain work to independent consultants. Also, please don't ask if I have a business plan because I'd rather spend my time making money than creating documents I don't have time for. She gives a good answer. Yogi Berra once said, "You've got to be very careful if you don't know where you're going, because you might not get there." Unfortunately, during the past 15 years or so, business plans have morphed into a marketing tool to raise money. Entrepreneurs just don't bother to prepare them until a potential grant provider, lender or investor requires the document as part of the selection process. It's too bad, because useful startup operating plans or business plans are built around a clear understanding of the founder's desired business destination. And this destination is not vaguely defined as "to make a lot of money" or "to be my own boss." Entrepreneurs who say they are overwhelmed by their business rarely have a documented plan in place. Hiring, customer targeting and other important decisions are driven by the needs of the day. It's what I call the Band-Aid approach to management. It's patch-driven rather than purpose-driven. I first learned about Katie through a Google alert set up to find people talking about our Business Plan Pro software. I read through her blog and got interested in her story. Katie's journey is still in the beginning stages; she's currently searching for funding for her fashion consignment shop. I am certain there are more than a few of you who are either exactly in Katie's predicament or have been there with having a good business idea and going through all the right motions, but not going anywhere fast. I asked Katie if she'd be willing to share her story with the Business in General blog readers and she agreed. I'm excited to see the beginning of this story and hopefully we'll be able to post some continuations of her journey towards success. I didn't always know I wanted my own business, unlike many entrepreneurs out there. I didn’t even know I wanted my own business when I graduated from college two years ago. But I know the seed was planted while I was in college - for three years I worked at a trendy consignment store where I was surrounded by fashion, met new people everyday, and had a great boss. I knew how to run the store inside and out, but I was always curious about how she started the business. I remember always asking questions about how she got started, how she found her initial consignors, and where she found her store supplies, and I remember her telling me once that I should open my own store. That thought remained in the back of my head as I finished college. I graduated from Western Michigan University in Kalamazoo, Michigan, and moved to Florida three months later. I was glad to finally have a degree in journalism, and while writing is something I do enjoy, it is not my passion. In a conversation last summer about careers and my love for my college job, I decided that I did want to open my own consignment shop. My vision for the store was simple - create a unique shopping environment that gives customers a fun and rewarding experience. The next step was finding someone who believed in my idea enough to take a chance on my business. I knew that a young woman such as myself wouldn’t be taken seriously without a business plan, so when I was introduced to Business Plan Pro, it was perfect for me. The sample plans were a great starting point for me, and the software allowed me to use specific sections that related to my business. Creating weekly sales goals allowed me to draft a realistic sales forecast for my first year in business. Completing my plan was very satisfying to me, and it got me one step closer to my goal: opening a shop of my own. Business plan in hand, I first sought advice from my local SCORE chapter. I was disappointed in the lack of help - apparently the common task at my local chapter is helping entrepreneurs write their business plans, and since I already had one, they were unsure of what to say to me. I was told “I believe you have an excellent business plan and that you will succeed,” and even “are you single because my son is your age,” but they were not allowed to point me in the direction of lenders. So I began researching SBA lenders online. I researched several companies, and the one I chose to work with ended up being the single biggest mistake I’ve made so far in my journey. What started out as a shared interest - finding a reasonable loan for my business- ended with horrible communication and a complaint filed with the Better Business Bureau. Lesson learned - I am now focusing on nationally known banks with local branches where I am able to physically GO inside and communicate in person with potential lenders. When attempting to get lines of credit or loans through my own 2 personal banks, I found they do lend money to small businesses but not to start-up's, typically only to existing businesses. I feel in general, that young entrepreneurs are not supported - every possible lender wants you to pledge money or real estate but if I had all that would I even be asking for a loan? The best thing I did for myself in building my business was create my blog - Faux Pas Fashion - which chronicles my journey, including the daily happenings, helpful business blogs and ideas I have found, and my goals. Through my blog and my constant reading of other blogs, I have met some incredible people who have supplied me with advice, recommendations and most of all, inspiration. I have contacted numerous entrepreneurs across the country to introduce myself and to ask for advice, and the responses motivate me to keep going during rough patches. The biggest struggle I’ve had thus far has been my search for funding. I have good days and bad days, which I imagine is typical for most entrepreneurs. There are days when I make ten phone calls and not a single one is returned, and there are days when I fear I won’t find an ideal location (I had found a perfect place a few months ago but it has since been leased, so I have resumed my search). But there are also days when I reach out to others - women business owners in the area, local consignment store owners, etc., and I am uplifted hearing their stories. The good news is, everyone I've talked to about my idea LOVES my business plan and honestly want to help. But the economy is faltering, I have no collateral to pledge and banks do not feel comfortable lending unsecured to me. I'm 2 years out of college and don't have any assets, a common problem for a young entrepreneur like me. I am currently applying for loans through a (trusted) local bank, and I have no intention of giving up my quest for financing. I was never told that the entrepreneurial route is an easy one, and I’ve obviously encountered my share of setbacks, but I’ve never wanted to give up. Since writing this, Katie has been turned down for another loan and is now looking to online solutions such as Virgin Money and Prosper. I really liked Lindsay Holloway's 11 Internet Myths Debunked today, quoting Justin Kitch of Homestead.com. I posted some additional comments on this at Up and Running, so you might have seen it there, but I thought it was worth flagging on this blog too. It's: 11 Internet Myths Debunked - Entrepreneur.com. Whether that's Lindsay or Justin, she or he nails it. Pay special attention to the 11th, the best of the bunch, but they're all good. Business is global. We have a global economy. Planning should be global as well. Business Plan Pro® Version 11.0 is designed to facilitate planning in the global environment. When starting a business plan use the Plan Setup to choose a language pack, Spanish for example. 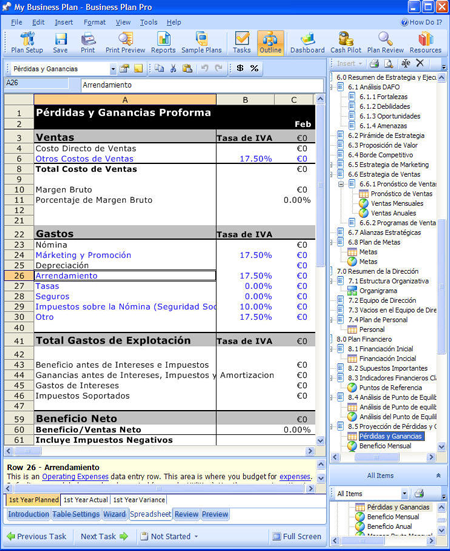 The software then formats your topic outline and financial table row labels into Spanish. El negocio es global. Tenemos una economía global. El planeamiento debe ser global también. Business Plan Pro® Version 11.0 se diseña para facilitar el planear en el ambiente global. Al comenzar un uso del plan de negocio la disposición del plan de elegir un paquete de la lengua. El software ajusta a formato sus etiquetas de la fila del contorno del asunto y del cuadro financiero en español. Les affaires sont globales. Nous avons une économie globale. La planification devrait être globale aussi bien. Business Plan Pro® Version 11.0 pour l'union européenne est conçue pour faciliter projeter dans l'environnement global. En commençant une utilisation de plan d'affaires l'installation de plan de choisir un paquet de langue. Le logiciel compose vos étiquettes de rangée d'ensemble de matière et de tableau financier dans le Français. Geschäft ist global. Wir haben eine globale Wirtschaft. Planung sollte global außerdem sein. Business Plan Pro® Version 11.0 für den europäischen Anschluß ist entworfen, um, im globalen Klima zu planen zu erleichtern. Wenn ein Unternehmensplangebrauch die Plan-Einstellung begonnen wird, einen Sprachensatz zu wählen. Die Software formatiert Ihre Aufkleber Reihe der Themaumreiß und der Finanztabelle in Deutschen. Il commercio è globale. Abbiamo un'economia globale. La progettazione dovrebbe essere globale pure. Business Plan Pro® Version 11.0 per Unione Europea è destinata per facilitare progettare nell'ambiente globale. Nell'iniziare un uso di programma di affari la messa a punto di programma scegliere un pacchetto di lingua. Il software formatta le vostre etichette di fila del profilo di soggetto e del quadro finanziario in italiano. Back in the early '90s I joined a season-long NFL football pool with some friends. The format was simple: before the season started, you filled out the entire schedule for the coming year, circling the team you thought would win each game. Then you watched the actual season play out. Each time one of your predictions proved correct, you got a point. The person with the highest point total at the end of the season was the winner. This is harder than it sounds. A lot changes during the regular season — players get hurt or go into slumps or get suspended for misconduct, new stars emerge, teams have good chemistry or they don't, coaches inspire or alienate their squads. Everything changes, but your preseason picks stay the same. I've participated in this pool nearly twenty times now. It's a tradition among my friends and family, and the bragging rights involved are not trivial. We still remind my friend's dad about the year my five-year-old daughter beat him out for third place despite having picked the winners based on either the cuteness of the teams' mascots (Go, Dolphins!) or the desirability of their hometown as a vacation spot (Yay, San Diego!). Over the years I've done better than most, winning four or five times now. But I've also felt my interest in the pool wane, and when I send in my picks next year it will be a friendly obligation, not the act of enthusiasm it once was. The trouble with the football pool is the format. There's just too much chance. No matter how much expertise I have and research I do (way too much for an unpaid observer, let me tell you), I don't have what I need to accurately forecast what's going to happen in week 16. I don't need more preseason data — I need regular-season data. Six of the top 10 teams in last June's ESPN.com's 2006 power rankings failed to make the playoffs. Last July, "SportsCenter" had football pundits Mike Golic, Sean Salisbury and Mark Schlereth spend a week producing an elaborate complete-season forecast. Their predicted Super Bowl winner? The Carolina Panthers, who failed to make the playoffs. They forecast Indianapolis would lose in the first round of the playoffs, while the Redskins, whose actual finish was 5-11, would be the league's third-best team. Four of the group's predicted postseason entrants (Atlanta, Carolina, Pittsburgh and Washington) failed to achieve a winning record. What does this have to do with business planning? Ideally, nothing -- except an awful lot of companies still prepare their business plans as if they were football pools. A better model for business planning — and football pools, for that matter — is what Tim Berry, our president, calls the "plan as you go" method. Sure, you need a "preseason" plan to organize your activities and get started. But once you see how that part of the plan fares in the real world, you can learn from that, and change course as necessary, so you're not still picking the Saints to win in week 4 after their offensive line has fallen flat and they've dropped their first three. Like Tim always says, your business plan will be wrong. The value comes in learning where it is wrong and making the changes necessary to still achieve your objectives in the long run. Call it the fantasy football model.